I studied abroad one glorious summer in the late 90s in Japan. I found the people to be wonderful, the cities to be clean and beautiful, and my experience enriching. And now I am watching with absolute horror at what is happening in Japan in the aftermath of the devastating earthquake. One of my closest childhood friends has been in Tokyo through this whole affair, and I worry about him greatly. So Friday Joie Studio's blog will be silent and I encourage all of you to give to the American Red Cross or to Shelterbox through the For Japan With Love website. Here it is. I've talked about it. And finally, here it is. Beautiful, gorgeous pictures of our wood veneer invitations, available for our two collections and for all custom orders. Above is Joie Studio's Malibu design, printed on birdseye maple. I think the birdseye pattern within the wood is such a lovely effect with the sea-themed invitation. Every wood invitation has a slightly different pattern and grain, making it totally unique. We are offering aspen, birch, maple, red cedar, and birdseye maple as wood veneer options for all of our wedding collections and for all custom orders, flat and letterpress printed. Contact us for more information and pricing. Today I lost one of my most beloved companions, my darling cat of 7 years. Sambora, named after my favorite guitarist, was hit by a car this morning. He went out when I left to take my baby to daycare, and when I returned, he was lying on the sidewalk just across the street from our home crying loudly but laying so still. We took him to the vet, where the vet surmised that he had been hit by a car. While the vet did everything he could, his injuries were just too severe. My ferocious cat with a sweet nature and a gentle heart is gone. He was a happy-go-lucky cat, always happy to greet a stranger or friend with a meow and a demand to be pet. And he was beautiful. People often asked where we got him and were usually surprised when they learned he came from the local Humane Society. I got him when he was 3 months old, sick and dying of a fungal infection but still racing around and jumping into trash cans. He was so silly with his antics. I was suprised one day when one of his photos was forwarded back to me by a friend - one of his photos that I posted online was on LOLcats. Sam was no pushover, he was a mighty cat - clumsy but fast and strong. As much as we tried to keep him indoors he wanted to be outside. He would bulldoze me at the front door to get out. He broke two window screens to be outside, where he loved to frolick, chase squirrels, watch the birds, and climb up our low tree. Sambora's love had no bounds. He came when called and patiently let us have our way with him. He was always there for a hug, to be pet, to provide comfort. He gave out kisses freely. When we brought Romeo in to our home, Sambora slept with the puppy, played with him, and groomed him. There was never anything but love with Sambora. And he was so good when we brought our baby home. We never had to fear what Sambora would do when the baby got rough. And the baby was rough - he pulled at poor Sam's tail, wrestled him to the ground, and petted him in the clumsy rough ways that young toddlers do. Sambora would take it all and loved the baby all the same. "Babo," as my son called him, was kissed and hugged and loved by my son, and tonight it was especially hard to hear my little boy call for his "Babo." Sambora has been there for me for 7 years. To celebrate with me, to console me, to love me. He helped me start Joie Studio with his love and support. Usually when I feel like this Sam would be right here, saddled up right next to me for as long as I need. And alas tonight he is not. I am heartbroken. Introducing Joie Studio's "Lauren" invitation - one of our new designs from the Couture Collection. I love the color combination of lemon yellow with our warm dove grey. I think it's just so stunning used together. And this has been one of those invitation designs that has been sitting around, just waiting for its day to shine. I've been trying to hold off on sharing before the National Stationery Show, but what fun would that be? One of my favorite little details about this design suite, and I honestly don't know if you can even see it in the picture above, is that the RSVP checkboxes mimic the the monogram design. Now I am wondering which of my other designs could stand a little lemon yellow pop to them. Hope you like Lauren! I sure do! A long long time ago, I tested out letterpress printing on wood. I loved it but never really had the time to price it out and add it to Joie Studio's repertoire. These past six months, I'm finally comfortable enough with the pricing and the results to offer wood veneer as an option for invitations. Wood veneer is now an upgrade option for custom design work and all Joie Studio designs, either flat printed or letterpress printed. We are offering birch, maple, aspen, red cedar, and birdseye maple as options. It's such a fun eco-friendly alternative - the wood is sustainably harvested, grown in the USA, and has been minimally processed, using no chemical or water to produce the wood veneer. 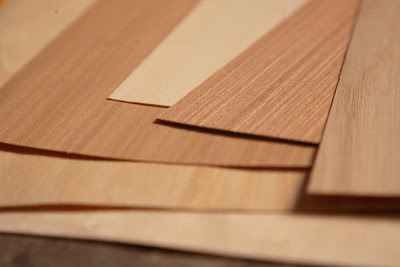 Did you know it takes less wood to create wood veneer sheets than it does to create a similarly sized piece of cardstock (unless you're Joie Studio and use only 100% recycled, cotton, or bamboo cardstock, of course). I love that when I call my supplier, the response on inventory is, "Let me see if we have any of those logs." It really is straight from a tree. I am going to officially debut our wood veneer invitations at the National Stationery Show in May, but hopefully by Friday I will be able to give you some sneak peeks of the wood veneer invitations. You know, I really thought I would have had more time to post more items. Between my son, my custom clients, and preparing for the National Stationery Show, I have learned one very important thing. I am not Wonder Woman. I am not Superwoman. I cannot do everything. The list that I made in October when I decided that 2011 was the year Joie Studio would be going to the National Stationery Show seemed so idealistic and doable. And now as I'm under 2 months before my crate leaves for New York City, everything is inching forward at what seems to be a snail's pace and requires more attention than what I feel I have time for. Ack! Luckily it means everything is progressing forward so things will be done roughly at the same time instead of tiered as I had hoped. 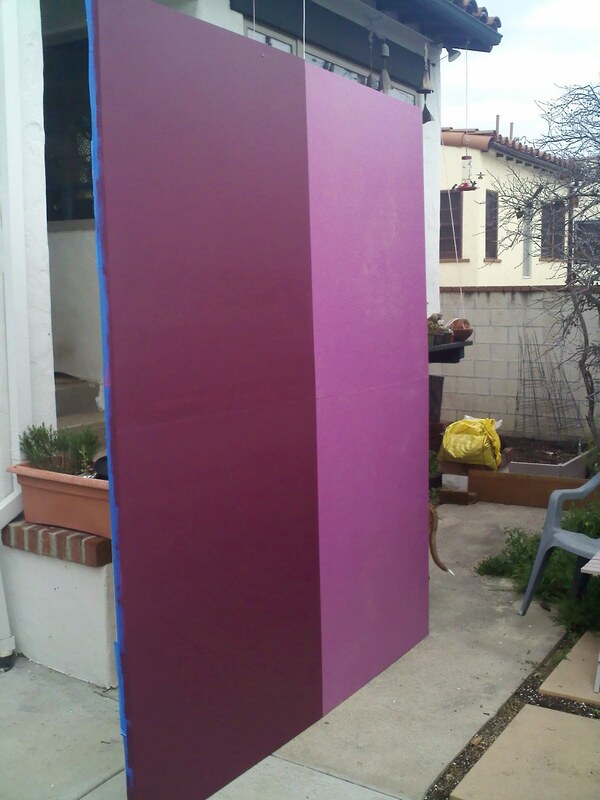 Booth Building - The executive decision was made pretty early on that Joie Studio will have hard booth walls at the Stationery Show. At first we talked about just buying the booth walls from the official National Stationery Show vendor. 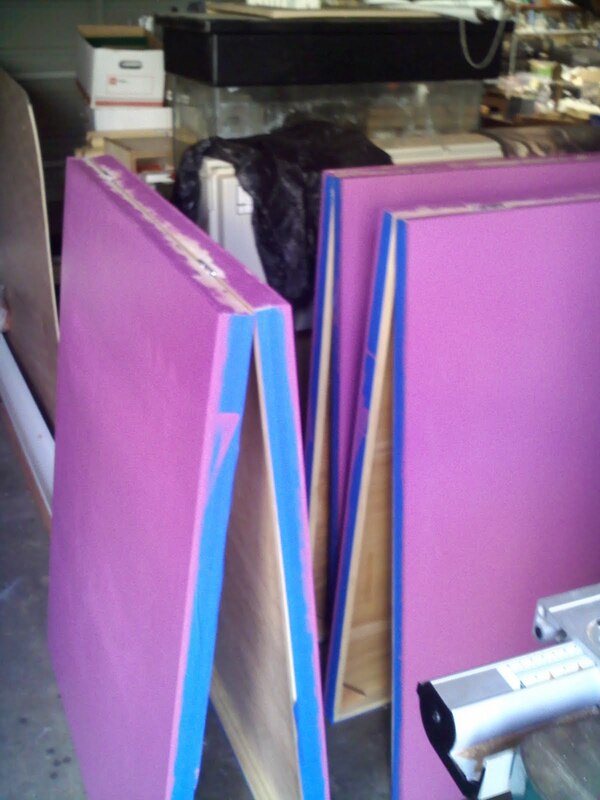 Then the sticker shock set in and we figured out that it was cheaper to build booth walls here and ship it back and forth from Pasadena to New York than to have temporary foam walls zipcorded up for us. I kid you not. One of my best friends and I drew schematics back in October and said, "How hard could it be?" Famous last words... Luckily my friend Chris has taken over booth building and he has drawn up some fabulous plans where my booth walls will also double as the shipping crate. Not to mention the meeting with the companies who are going to handle my booth graphics. After a lot of second guessing, my husband reassured me that my booth design would be great and not to worry about it anymore. Custom Wedding Albums - My friend Jennifer is hand-making my wedding album binders for me. Joie Studio had over 40 designs and it was so hard to condense it all into one collection that we're actually going to introduce two collections while working with our friends at SHOP TOAST to create a separate collaborative custom collection. It's an ongoing struggle to make sure that the albums have a good balance of colors and differing color combinations as I have my favorite color combos that tend to repeat itself a lot when I design. Joie Studio's Catalog & Such - I hate to say it but this product catalog has been something like 3 years in the making because I never really needed one. And now, I do. I really do. You might have noticed that the website got a little bit of a makeover as well. It's an ongoing process. I just ordered order forms and other assets for the show and finalized the letterpress promo mailer that will go out about a month before the show (holy crackers that's in one month!). I am also working on a mailing list for the NSS promo which is about 300 stores long at the moment. New Products - We have a bunch of new products being produced right now that I will share with you closer to the date. Since we're so close, I am trying to get a couple friends to come in to help me finish letterpress printing everything. Current Workload - Oh, don't think I was smart enough to stop business while I prepped for the Stationery Show. I mean, I have to pay for the show and Joie Baby's daycare somehow (and believe you me, it is costing quite the pretty penny to exhibit at the National Stationery Show). I have some major custom projects going on right now that constitute a full workload even without the Stationery Show looming. No more letterpress business cards until after May 19th. Sorry! Thank goodness for friends and family. Without them I'd be cooked. They are the ones that are going to get Joie Studio to New York looking fabulous. Now, it's back to work with me! I'll share when I can!